My Life and Activities here in KSA..: Monster Icebergs breaking it's drift closer to Australia..
Monster Icebergs breaking it's drift closer to Australia..
SYDNEY (AFP) – An island-sized iceberg is breaking up as it drifts closer to Australia, producing hundreds of smaller slabs spread over a massive area of ocean, experts said Monday. The 140-square-kilometre (54-square-mile) block of ice, known as B17B, was seen some 1,700 kilometres (1,054 miles) south-southwest of Australia's western coast on December 9, prompting a maritime alert for vessels in the area. But as it has tracked further north and east the iceberg has shrunk to some 115 square kilometres -- still formidable at about twice the size of Manhattan. "There are now many more smaller icebergs calving off B17B, measuring up to several kilometres in length, and spread over more than a thousand kilometres of ocean," said Australian Antarctic Division glaciologist Neal Young. Young, who has tracked B17B using satellite images from NASA and the European Space Agency, said the iceberg was some 400 square kilometres in area and 40 metres high when it first broke off from Antarctica. "If you didn't know about the early picture you would still say it's a monster," Young told AFP. Young said he expected B17B to totally dissolve but was unable to predict when this would happen. "Might be two weeks, might be several weeks. The key thing at the moment is it's getting thinner," he said. "It's got its feet in what it thinks is warm water -- about six to eight degrees Celsius (45 F) -- we think that's freezing cold but for an iceberg that's quite warm. "So it's thinning from the bottom and that's what's going to lead to it breaking up." The iceberg, which calved from the eastern end of the Ross Ice Shelf nearly 10 years ago, is expected to continue tracking in a more easterly direction. 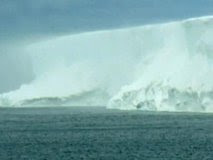 Australian authorities last week issued a shipping alert over the possible hazard from icebergs.